KENMONT CAMP FOR BOYS AND KENWOOD CAMP FOR GIRLS are America’s premier two-week and four-week sleep away camps. With exceptional leadership, staff, program and facilities, we provide an extraordinary camping experience with exemplary commitment to our campers’ happiness, well-being and safety. NESTLED AMONG THE FOOTHILLS OF THE BERKSHIRE MOUNTAINS our Kent, Connecticut location is less than two hours from New York City. 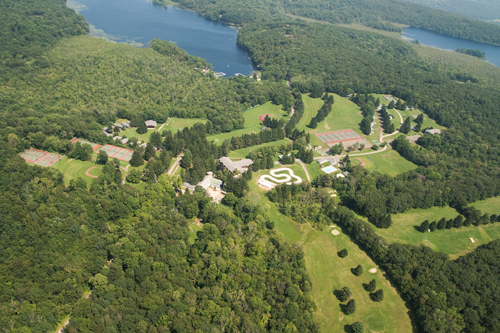 Our magnificent 200 acre property along the shores of North Spectacle Lake is the setting for our acclaimed brother/sister camps, offering separate and equal state of the art facilities for boys and girls. BUILDING LASTING FRIENDSHIPS WITHIN A CARING FAMILY ATMOSPHERE our camp environment nurtures the development of individual character, self-confidence, and the learning of teamwork and new skills. A COMPLETE CAMP EXPERIENCE with a beginning, middle and end. All our campers arrive together and go home together, allowing them the opportunity to develop the friendships and everlasting memories that make summers at camp absolutely fantastic! Activities: Animation, Arts and Crafts, Ceramics, Cooking, Dance, Performing Arts, Photography and Video, Rock Music, Theater, Archery, Baseball, Basketball, Fishing, Fitness, Football, Go Carts, Golf, Gymnastics, Kayaking, Ropes, Sailing, Skateboarding, Soccer, Softball, Swimming, Tennis, Volleyball, Wakeboarding, Zipline.